We have a lot be excited about. Democrats are energized like never before as we head into a really important election cycle. Democratic voter turnout set totaled 1,037,799 - more than double the turnout of the 2014 primary and breaking the previous turnout record of 1,036,907 set in the 1994 primary for Governor. Progress Texas “certified progressive” candidates won or advanced to the runoffs in 19 of the 22 flippable districts we tracked this primary cycle — five congressional, four Texas Senate, and thirteen Texas House competitive races in urban and urban-adjacent districts in the DFW, Houston, San Antonio, and Austin metro areas. In three congressional districts carried by Clinton in 2016, progressive Democratic candidates — most of whom are women and people of color and all on the “certified progressive” list — are heading into May runoffs to get on the ballot to unseat Republican incumbents in November. In Houston, Laura Moser and Lizzie Pannill Fletcher will runoff for a chance to defeat U.S. Rep. John Culberson (CD 7). In a Dallas race for a seat currently held by U.S. Rep. Pete Sessions (CD 32), Colin Allred and Lillian Salerno will face off in a runoff. The third race — in a district that runs from San Antonio to West Texas — Gina Ortiz Jones and Rick Treviño are in a runoff to take on U.S. Rep. Will Hurd (CD 23) in the general election. The Progress Texas board of directors endorsed a slate of seven candidates in the Democratic primary. All seven candidates - including Beto O’ Rourke for Senate and Mike Collier for Lt. Governor, won their primary. In case you haven’t heard, Ted Cruz will be on the ballot in November — and Beto is the formidable challenger we need to take him on. 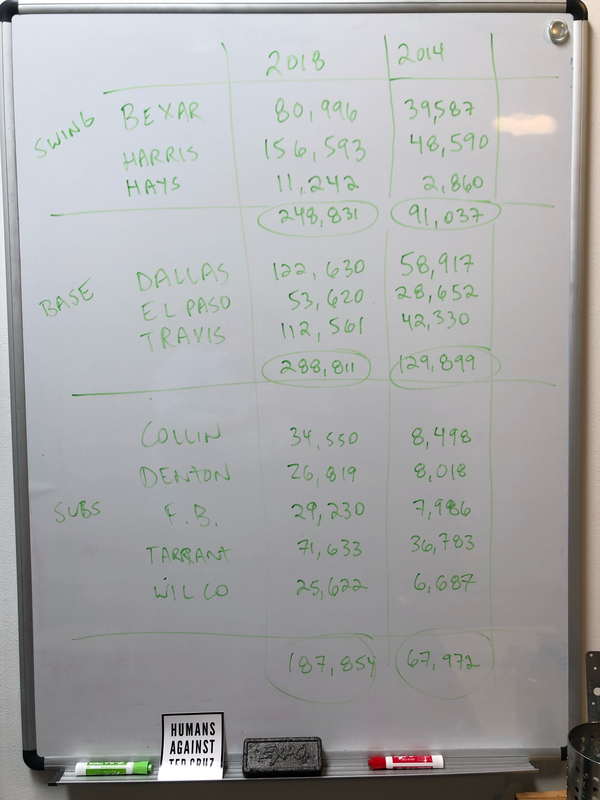 Beto won more votes in the 2018 primary than all Democratic votes in the 2014 primary. Texas is poised to send two Latina women to Congress next year. In El Paso, Veronica Escobar won her race to replace Beto O'Rourke (CD 13). In Houston, state Sen. Sylvia Garcia won the Democratic nomination to replace U.S. Rep. Gene Green (CD 29). Both these districts heavily favor Democrats in the general election. The nearly 50 female candidates in Tuesday’s primaries set a record for women running in Texas primary elections. More than half of the women running either won their primaries or advanced to runoffs. Gov. Greg Abbott and the state’s Tea Party group, Empower Texans, went after Republicans in the primary — and in a show of just how little sway they have in their own party, they mostly failed.